Ten days before the start of the Tour de France is a busy time for any ProTour team manager, but Wednesday was a particularly crazy day for Garmin-Slipstream team manager Jonathan Vaughters. During the same news cycle that reported rumors of Garmin’s interest in signing 2007 Tour de France champion Alberto Contador, the team also released its nine-man Tour roster, leaving off three active riders from last year’s squad. Vaughters has high hopes for this year’s Tour. Ten days before the start of the Tour de France is a busy time for any ProTour team manager, but Wednesday was a particularly crazy day for Garmin-Slipstream team manager Jonathan Vaughters. 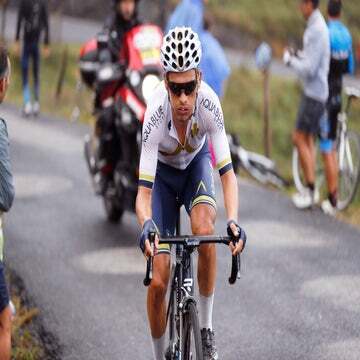 During the same news cycle that reported rumors of Garmin’s interest in signing 2007 Tour de France champion Alberto Contador, the team also released its nine-man Tour roster, leaving off three active riders from last year’s squad. On a day he described as one where the phone was “stuck to his head,” Vaughters spoke with VeloNews about the difficult decisions he faced with Tour team selection, the team’s long-term plan — and whether or not that might include signing a top GC rider like Contador — and a BBC report that Garmin’s David Millar and Bradley Wiggins might be joining the British Team Sky. Rumors that Garmin was in discussions with Contador had rumbled through the racing community for weeks and were first reported Tuesday on Joe Lindsey’s blog on Bicycling.com. Lindsey’s story reported that Contador was exploring his options should the current Astana team dissolve due to financial problems, and that the Spaniard and several compatriots were looking for a new home, while Astana’s Lance Armstrong and Levi Leipheimer would use the team’s infrastructure, owned by manager Johan Bruyneel, to start up a new squad sponsored by Armstrong-affiliates Livestrong and Nike. The story went on to report that the deal between Contador and Garmin was to be announced last Saturday until Astana was able to guarantee its $6 million bank guarantee with the UCI. Additionally, according to a team source, Garmin’s team Felt bikes were already on the way to Contador. Felt marketing director Doug Martin told VeloNews he had heard nothing of the team’s signing Contador, and that no one at Felt had shipped bikes to him, but that didn’t necessarily mean the team hadn’t shipped a bike from its own stock to the Spaniard. The addition of Contador to Garmin would have a huge impact on the American team on several fronts: not only would Garmin take a race favorite to the Tour, but it would also mean a potential split in team leadership between the Spaniard and the team’s current GC leader, Christian Vande Velde, who finished fourth overall at last year’s Tour but suffered multiple broken vertebra during the first stage of the Giro d’Italia last month. Vande Velde returned to racing at last week’s Tour of Switzerland but finished an anonymous 81st overall, and 38th in the final-stage time trial, 3:20 behind stage winner Fabian Cancellara. An argyle-clad Contador would also likely bring the American team in direct competition with Armstrong, who told VeloNews last week that he still considers an eighth Tour win a possibility. On the topic of the American team replacing its American team leader with the 2007 Tour champion, Vaughters said that he wouldn’t make a decision on such a matter without first discussing it with Vande Velde. Vaughters added that whether or not the team was considering signing another grand tour GC contender would be regardless of Vande Velde’s injuries at the Giro. Dating back to the Colorado-based team’s inception in 2004 as TIAA-CREF, the Slipstream Sports-managed squad has been primarily American and English-speaking, with Colorado riders such as Timmy Duggan, Danny Pate, Will Frischkorn and Blake Caldwell all long-time members of the squad from its developmental days. That changed somewhat at the outset of the 2008 season as the team signed foreign riders such as David Millar, Magnus Backstedt and Julian Dean, as well as foreign team directors Matt White and Lionel Marie; however those staff members are all English speakers. Vaughters said that as the team grows it must expand, particularly given Garmin International’s broad marketing objectives, and that he wouldn’t preclude signing non-Anglophone riders. Vaughters’ team has also become known for its strict anti-doping policy, and since 2007, for spending its own money on third-party blood-monitoring programs such as the Agency for Cycling Ethics and Don Catlin’s Anti-Doping Sciences Institute to ensure its riders are racing clean of performance-enhancing drugs. Though he’s never tested positive, Contador’s name was originally linked to the Spanish blood-doping network Operación Puerto. The Spaniard was excluded from the 2006 Tour after he and several of his Liberty Seguros teammates were implicated in Puerto. A Spanish judge and the UCI both later cleared Contador of any involvement. Responding to a BBC report posted Wednesday that Millar and Wiggins would leave the team at season’s end to join the new British pro squad, Team Sky, Vaughters said he hadn’t seen the story and wasn’t overly concerned. However Vaughters said that Wiggins, who has finished second in time trials this year at Paris-Nice, the Giro d’ Italia and Criterium International, is in the middle of the first year of a two-year contract. As for Millar, whose arrival in 2008 came with a small ownership stake in the team, Vaughters said he couldn’t say for certain. On the same day that Vaughters was answering questions about Contador and Team Sky, his Garmin team announced its Tour roster. And while many of the names on the list weren’t surprises, there were a few notable absences. Missing from last year’s team is American Will Frischkorn, who not only finished second on stage 3 last year, but also finished his first Tour. Also finishing their first Tours last year and left off this year’s team were Aussie Trent Lowe and Dutch rider Martijn Maaskant. Riders in contention for the Tour team but left off include American climber Tom Danielson and Canadian strongman Svein Tuft. Vaughters said leaving Tuft off the team was a difficult decision, particularly after the team had withheld Tuft from racing the Giro to preserve him for the Tour. But Vaughters said that Tuft, who took a silver medal at last year’s world time trial championship, has struggled this year after a concussion at the Tour of California and a knee injury at Three Days of De Panne. Vaughters said one goal remains — winning the team time trial, even if he caught heat from Columbia-Highroad’s Mark Cavendish prior to the Giro d’Italia for stating Garmin’s season “began” with the Italian TTT. Garmin finished second on that stage, just six seconds behind Columbia, with Cavendish taking the race’s first maglia rosa. One thing appears certain, however — should Contador stand atop the final podium in Paris, he won’t be wearing argyle.